The Chop House is an elegant, fine dining restaurant in Charleston, West Virginia that is a part of Mainstreet Ventures Inc. The restaurant offers familiar steak and seafood dishes along with plush furnishings and a cigar lounge. The menu features USDA prime-rated beef steaks that are wet aged for 28 to 34 days to ensure a flavorful, melt-in-your-mouth perfection is achieved. 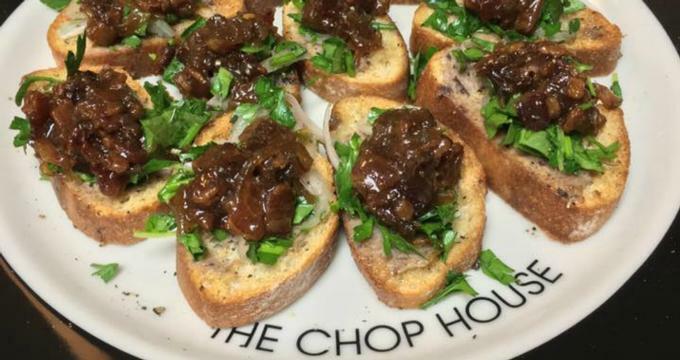 The Chop House operates daily, Monday through Thursday from 5:00pm to 10:00pm, on Fridays and Saturdays from 5:00pm to 11:00pm, and on Sundays the restaurant operates from 5:00pm to 9:00pm. · Entrees - Filet mignon, espresso-rubbed filet mignon, steak frites, beef Wellington, chargrilled Berkshire pork chops, Australian rib lamb chops, rosemary scented breasts of chicken, roasted rack of venison, lump blue crab and lobster cakes, miso glazed Chilean sea bass, north Atlantic salmon, pan seared diver scallops, and more. · Cocktail Hour - Selected martinis, house wine, domestic beer, craft imported beer, and a bar menu offered in the lounge area only. · Bar Menu - Sweet and spicy calamari, French onion soup, sesame salmon, maple black pepper bacon, Caesar salad, jumbo shrimp cocktail, salmon and avocado tower, oysters Rockefeller, petite lamb chops, lobster bites, burger, bread basket, and add-ons like sautéed wild mushrooms, caramelized onions, Roquefort, white cheddar, and onion rings. The restaurant accepts phone call reservations made via phone call at 888-456-3463. The Chop House caters to all types of private dining events with its elegant fares and premium wine selections coupled with extraordinary service. Private event space can be booked with a credit card by contacting the restaurant at - gmchophousewv@msventures.net or by calling the events section on 304-344-3954. · The Glass Room - A fully enclosed private dining room that can accommodate up to 20 guests. The room comes with audio-visual equipment, perfect for corporate presentations. · The Captain’s Table - A semi-private dining room that can accommodate up to 10 guests. This intimate space is popular as “The Library” for its stately setting. · The Chef’s Table - A semi-private dining space that can accommodate up to 8 guests, making an ideal space for small business groups. The Chop House Gift Cards can be used at any of the Mainstreet Ventures (MSV) restaurants. The gift cards can be purchased at the restaurant by calling the reservations section or by placing an online order through the gift card order form available on the Mainstreet Ventures Inc. online store.